Stay connected with the Eton FR1000 Voicelink radio. 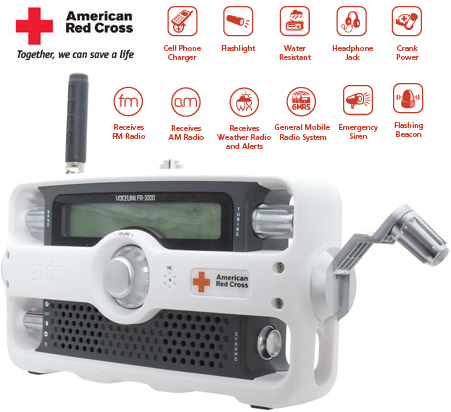 This emergency crank radio combines two-way GMRS radio technology with AM, FM and NOAA weather reception. There is also a built-in flashlight. The sophisticated GMRS/FRS two way radio features 22 channels and 121 privacy codes (38 CTCSS/83 DCS). The power source is: four AA cells (not supplied), NiMH battery pack. An AC adaptor is included. There is an LCD display with 12 hour alarm clock. Other features include: siren, low/high power, VOX, external speaker/mic jacks, dual watch and monitor functions. The FR1000 has the additional capability of recharging certain cell phones (required interface cable is not supplied). 11.1 x 6.2 x 4.2 inches 2.2 lbs. Please note that an FCC GMRS license is required to legally transmit with this radio. For F.C.C. license information call 1 888-CALLFCC or visit http://www.fcc.gov (request form 605). Copyright 2007-2014, Universal Radio, Inc.